This week First Lady Michelle Obama launched Let’s Move! Child Care (covered in the Washington Post). 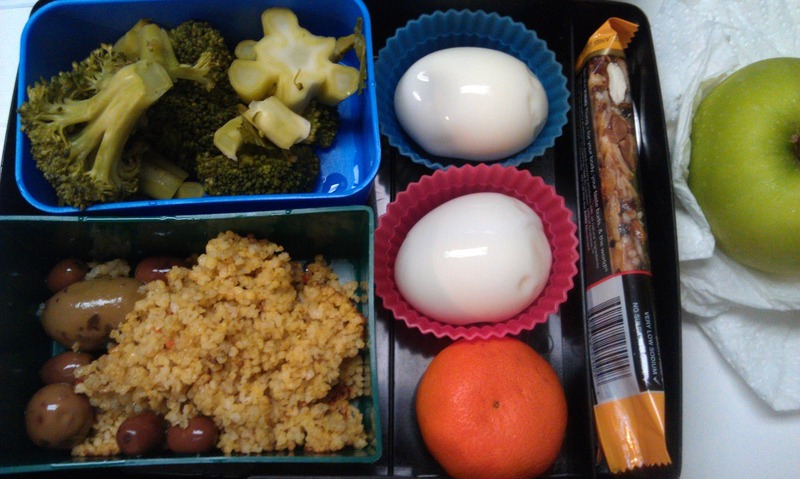 I’m excited about the focus on early nutrition in a place where many kids spend most of their day, including my son. The First Lady and I are doing the two-step — I started in eating school lunch every day in January 2010, which was later that same month that she announced the Let’s Move! campaign. Then, I finally got around to doing something about the food at my son’s day care center and here she is advocating similar changes to day cares across the country. How cool! My kid likes these little wraps. They look cute, but are hard for him to pick up and when they start to fall apart before he can bite them, he starts freaking out. He wasn’t crazy about the lentils when my husband served them (the night before), but I threw them in anyway. 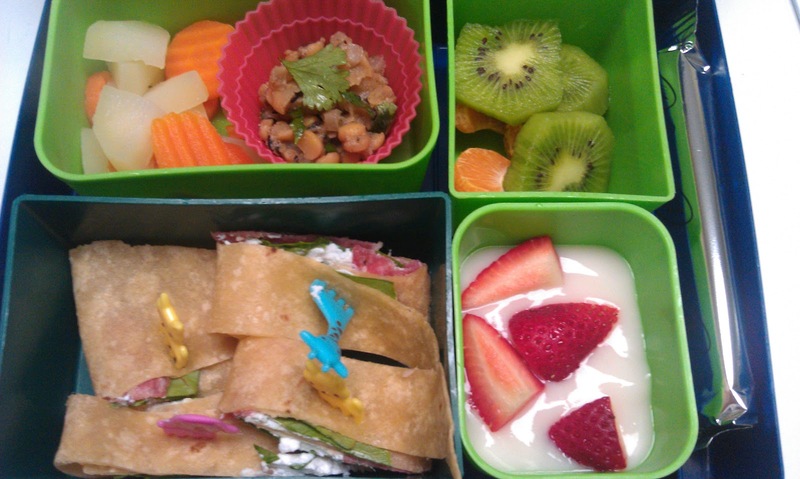 Day care menu: ground beef, mashed potatoes, orange wedges, diced carrots with fruit and yogurt as snacks. Definitely a fav meal of his! 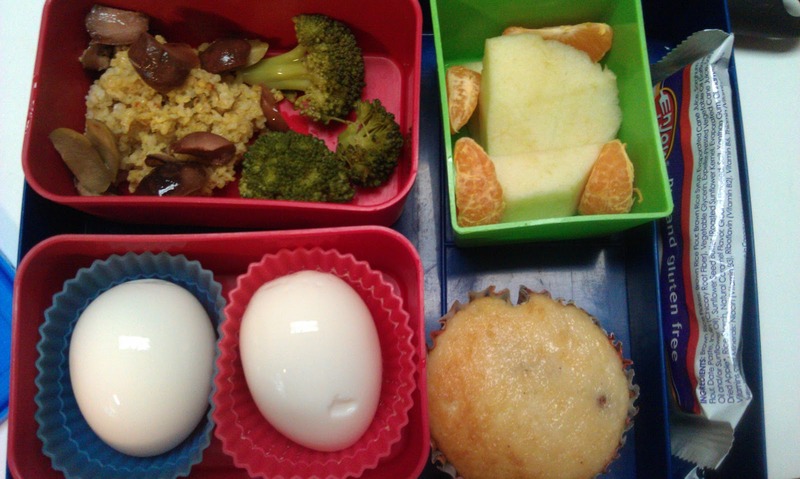 Day care menu: scrambled eggs, mozzarella slice, pinto beans, watermelon with mandarin oranges and blueberry muffin as snacks. I took a risk giving him a lot of one thing, but I think it went alright. However, he told me he picked out all the peas! Gah! I thought I had him trained! 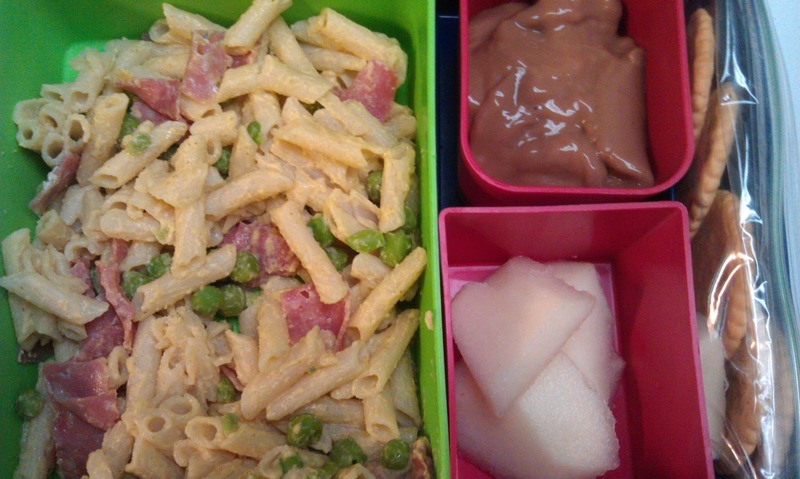 (that’s a joke by the way) Day care menu: battered cod, pasta with alfredo sauce, peas, diced peaches with shredded cheddar and strawberry frozen yogurt as snacks. He requested pancakes so I put one from the fridge in there. I’m sort of flying blind as I really don’t know what he is eating at day care and what is getting thrown out. I think they rinse everything before sending it home so that his laptop lunch bag doesn’t stink up the room when it’s placed in his cubby after lunch. The purple noOodles started out white, but when I mixed them with boiled cabbage (and sweet red chili sauce), they changed colors! So fun for him! They tasted so good, but there was only enough for his lunch and not mine. I was disappointed! Day care menu: cheese ravioli, wheat bread, green beans, pineapple with banana pudding and hummus with crackers as snacks. I can eat limited goat cheese now. This stuff tasted so amazing to me and that surprised me as I really have never been much of a goat cheese kinda person. I think I’m just desperate. My husband made the lentils from a recipe in an Indian cookbook. I think I mentioned before that he went to the library and checked out books on Indian cooking months ago. Then he photocopied the recipes he liked and put them plastic protectors in a binder. This guy is serious! The lamb was terrific, but the roasted portobellas??! They blew my mind. I never did that before, but I will be doing it again. I just googled “roasted portobellas” and found this recipe. I knew that my vegetarian friends liked portobella mushrooms prepared that way so I thought I’d try it. Gimme more! Thanks for the mushroom link–I love them grilled but hadn't thought of roasting. Dinner tomorrow solved! The portabello mushrooms sounds delicious, I am definately going to try the recipe! 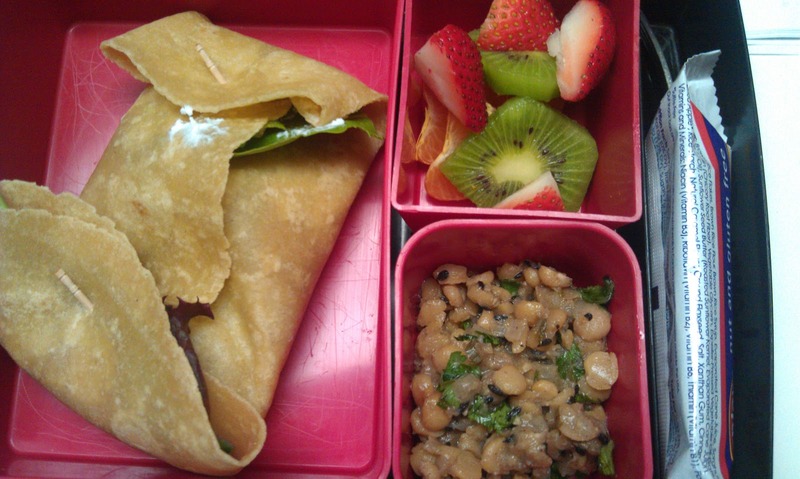 Love seeing your son's and your lunches. I especially loved the blue noodles, they look fun! Never roasted my portobellos either, I will this week though! brown rice curry cous cous with olives? Sounds fantastic! Care to share that recipe? Awesome! After having a lunchroom demise last year (which I think you remember) and a few other bad experiences, I changed my son's school to a place where there is no cafeteria. 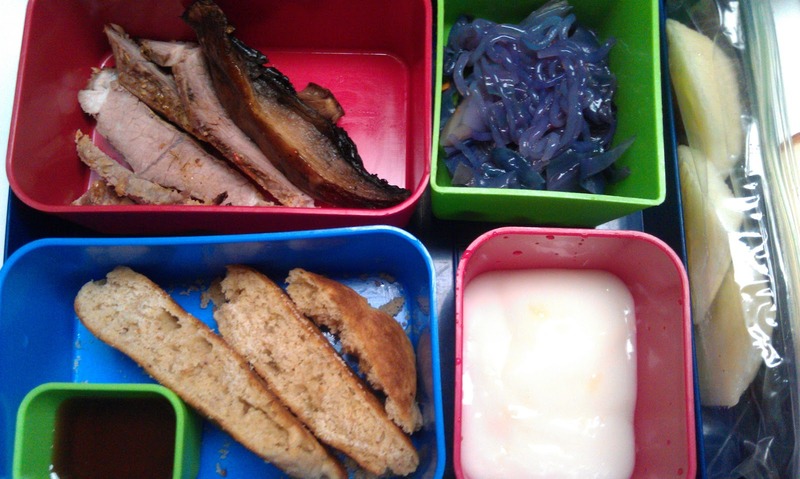 All the kids bring their lunch and the school has standards – "no rubbish" is what the school principal says. I'm loving it and you have some amazing ideas here that I will definitely be trying. Yes – brown rice curry cous cous with olives recipe please! Hard boiled eggs… geat idea. My son will love that! Oh! I will be trying that portobello recipe soon!! Looks amazing! 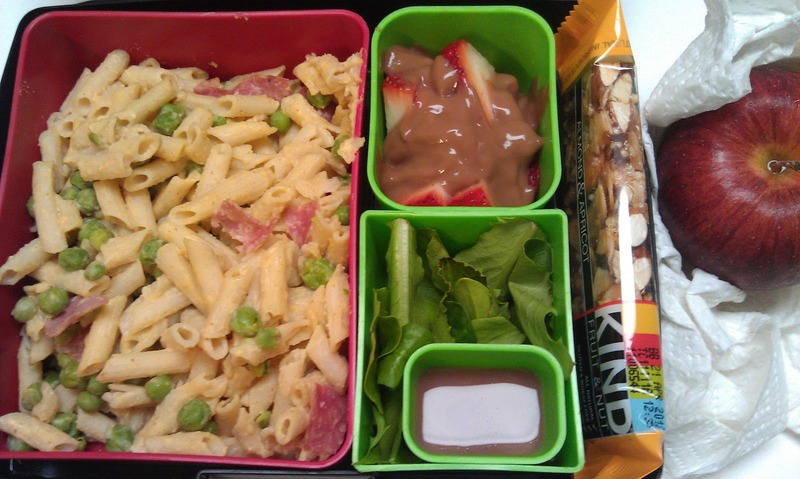 I must say, you have come SO far in your creativity for you and your sons lunches! 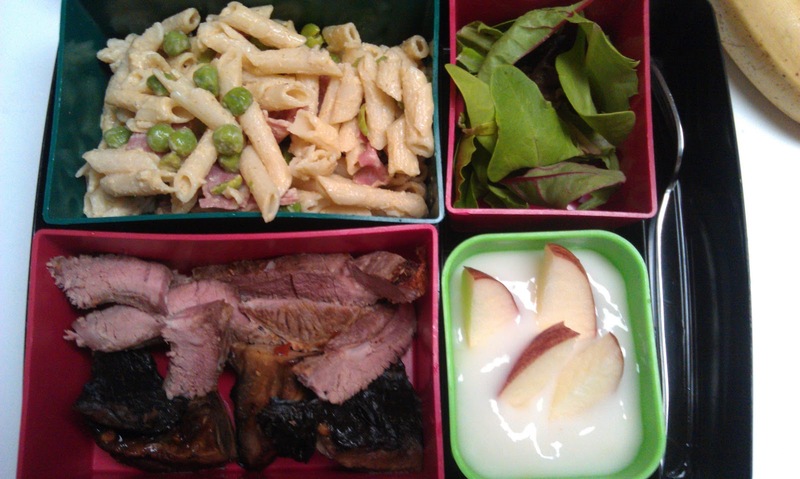 I smile looking in his lunchbox at the variety of food, ample veggies, a solid protein at every meal, and FUN!, no boring foods in there!